A newly renovated, charming and spacious stone farmhouse, nestled at the end of a quiet country lane in a small hamlet. It is just 1.5kms from the village centre of Seglien which has a bar, boulangerie and post office. The tourist attraction town of Guemene-Sur-Scorff which has bars, banks, restaurants, supermarket, boulangeries etc.. is just a 10 minute drive away. This property dates back almost 300 years and has been renovated to a good standard, combining the original features such as beamed ceilings, exposed stonework and breton fireplace, with a modern tiled, open plan split level living space on the ground floor. To one end is a fully fitted kitchen with ceramic hob, electric oven and plumbing for dishwasher, this is open to the dining area which has glazed doors out to the garden. There's a step up to the living area with a substantial woodburner set into the fireplace. The ground floor measures approx' 70m2 and there is also a handy utility room with plumbing for a washing machine, plus a shower room with w.c., double hand basins set in a vanity unit and a shower cubicle. The wooden stairs lead up to the first floor, which is light and airy and has laminate wood flooring throughout. The landing area runs the length of the property with doors off to 4 bedrooms, 1 dbl 11.5m2, 2 twins (8.5m2 and 10.5m2) . Plus one single to be finished (or could be a possible dressing room/ ensuite 6.5m2) and a bathroom to equip (plumbing and first fix done) 6.3m2 . 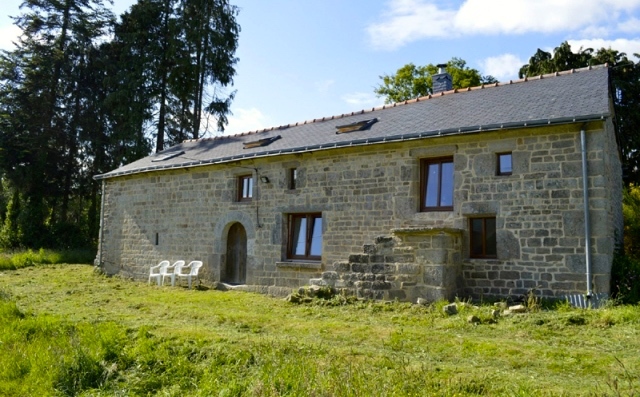 The property is set on a good sized plot of 1164m2, with parking and a pretty stone barn, there is also a seperate plot of land which has a stream 3462m2, this is just along from the property and currently used for horses. This old farmhouse would make a great family home and is currently being let out as a family holiday property. The house further benefits from a new roof, double glazing throughout, a new septic tank and broadband. Just 10 minutes away from the beautiful lakes of Guerlédan, Nantes Brest canal and the abbey of Bon Repos. The beaches of the South Brittany coast and train links from Lorient can be reached in 55 minutes.The airports at Brest and Dinard are an hour 45mins away, and the ports of St Malo and Roscoff are just under two hours away.